It's been all change over the last few months, family and work, nothing acrimonious tho! Being self employed, home changes can effect work and vice versa. For a while it was really difficult to keep up in both areas. But now we are all sorted although work has backed up considerably so lots of head down to catch up! When is the first race? What do I need? Goggles, kidney belt etc and where to apply for licence? (how lucky am I to have a wife with that outlook). She was talking about the fact that for the last 30 years I had always felt that I had just adjourned Motocross and had fully expected to go back! The reason that I had stopped was still with me, that is some quite bad right knee damage and as I get older, some quite bad psychological fear of tight right hand corners Or anything that might punt the knee! But, what if I were to do pre 65 motocross? The tracks are certainly more friendly, a 250 would not be too aggressive and surely a small club level would be laid back fun! Now we have a plan. Next step was to find a club and there on my doorstep was the famously friendly Dorset Classic Scramble Club http://www.dorsetclassic.com/. Now for the bike, I mentioned that I have very little time and cannot really afford to go out and buy something ready to race. There in my workshop is my own C15 T BSA project. That will do just fine to go and have some fun without too great an investment. As you will have seen I am already building another C15 into an "Otter" trials special for a customer. During the sourcing of parts for this, I was introduced to Terry Weedy of Avery Products http://www.terryweedy.com/ near Southampton. Terry is the person to go and see if it's british scrambles and trials you are interested in. So my own C15 engine is back on the bench for some closer scrutiny. The plan is to fit a C15 MX Cam (they are a little more difficult to find now), The inlet valve on the C15T is already slightly bigger than the stock bike. I have found a new 10:1 CR piston. The ports in my head are already dressed and I have new bronze guides, slightly modified to suit.. I don't want to go too large on carb and ports because I think an engine with bottom to mid power would suit me (to point and squirt through those scary right handers). The downside of my engine is the early version timing side bushed main bearing, known to be a weak spot. The cost of modification by Alpha bearings is too high for my current budget but maybe I can ease the situation by having a special "White Metal" version. Because I work with this type of bearing most of the time (http://www.formhalls.com/), I have a great deal of respect for the material robustness even when used in extreme 30's and 50s racecars and aircraft engines. Any way it's worth a go. Lubrication will be Castrol R of course. The frame is the second generation T which I understand was designed for scrambles originally. Certainly it will be fine to start on. Wheels on my T are the same as the American export model, they have large brake drums and are really heavy. I have a rear Bultaco or similar wheel which is much lighter and should go in without too much trouble. The front may be a Cub or Bantam type laced to an old 21" alloy rim that I have. It always pays to hoard! Here's some pictures for inspiration.Not C15 scrambles but you get the idea. As I seem to be getting to know these little 250s, the little flat tracker may be something for the future. I cannot claim to have worked on this car but it was in the workshop of a company I once worked for. It is the most imposing, burlesque fantasy car I have ever seen. Powered by a Voison V12 sleeve valve, it seemed to suffer from the typical heavy oil smoke problem, typical of sleeve valves. I hope Motorsnaps.com don't mind my use of this image that captures the style perfectly. Please ask for Eric in the above correspondence. The Historic Engine Co. Ltd. continues to evolve. Following many years based on the south coast of the UK, we now operate on the beautiful Oxfordshire and Gloucestershire border, surrounded by wonderful countryside and woodland so typical of this location. Just a few miles to the North we have the picture postcard town of Burford and a few miles to the south we have England's oldest inland port, Lechlade on Thames. In this more centralised location, we share the considerable sized Broughton Poggs Business Park with Fiennes Restoration to whom we are now proudly affiliated. Fiennes have a worldwide reputation for their unique service to Rolls-Royce and Bentley motor heritage. 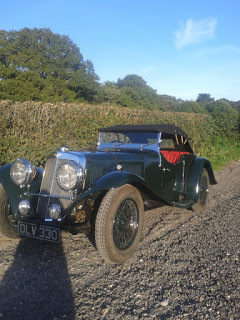 We will continue to provide a very competitively priced service to vintage, pre and post war, motoring and racing "machines", we will also continue to provide assistance with vintage and classic aviation projects as before. If you would like to visit our new premises we would be very happy to introduce you to our workshops and projects, with coffee in hand. Please contact us if we can help with a project or for free, no obligation advice. Here at The Historic Engine Co, although small, our premises are organised to allow low overheads and importantly, low hourly rates. Thank you for looking in. You will see a mixture of topics, motorbikes, art and flying are my own interests, but these overlap with the work that I am fortunate to be involved in. Here, with the customers permission you will see some of the projects, past and present. Feel free to add any comments and questions, I will do my best to answer promptly. Always great to see your projects and workshops and to hear your adventures, please e mail them or send a link.